Happy Friday! Read across America Day also celebrating Dr. Seuss' birthday is celebrated on March 2nd. Nikolai has a nearly complete collection of Dr.Seuss books and today's bento is so much fun to make based on The Sneetches. I am going to re-read this book to him tonight. Although Nikolai prefers to read on his own lately, we talked him into allowing us to read to him as quality family time. 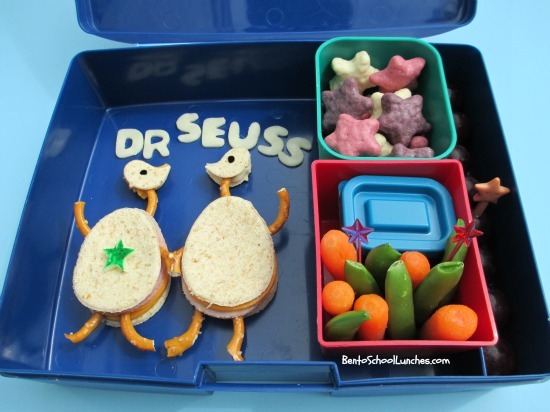 Want to see more Dr.Seuss themed lunches? Head over to Bento USA and Bento Bloggers and Friends that are hosting a linky party. Main section: Sneetches sandwiches are made from egg shaped cookie cutter and head is made from a small bird cutter. Star is Asiago cheese colored with green food safe marker. Arms, legs and necks are cut from pretzels. Lettering cut from Asiago cheese. Lower right: Baby carrots and sugar snap peas. Ranch for dip in the small container. Far right edge: Seedless red grapes. Packed in Laptop Lunches. ooohh....the Yogurt covered stars from Trader Joe's looks yummy!! Cute Sneetches sandwiches!! These are so cute! Hope you had a great weekend! bentodays, thanks so much! We had a fun weekend and here is Monday again which always comes too fast.